Are you holding your party during the day but still want to amaze your audience with impressive fireworks? Worry no more. Our innovative daytime fireworks will deliver the brightness you need to make an impression whilst the sun shines. Our aerial shell designers have come up with some of the most pleasant and functional color combinations that will help you set the event’s mood right. 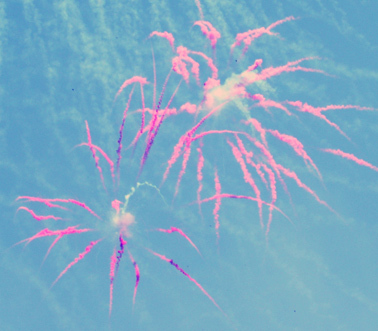 We believe in having fun at any time of the day, and our daytime fireworks efficacy resonates with this. Our daytime fireworks are a perfect replacement to bang rockets and fireworks that are otherwise prohibited at other times of the day. With our products, you’ll enjoy one of the most intense displays without the noise and residual powder generated by regular fireworks. Our innovative designs and ability to work with wide ranges of colors will always ensure that your event stands out from the rest. With our professional daytime fireworks team, you can rest assured that the fireworks will be part and parcel of the party. Even though people prefer using the fireworks to kick off or end a party, our state of the art equipment will help you cue the fireworks deployment in perfect sync with other events in the party. You can use the daylight fireworks just before the cryogenics & fog, or use them at the climax of the presentation. Whatever time it is, the fireworks experts and the equipment we use will always help you create a truly memorable show. Get in touch with us today. Let us know about your daytime party plans. We will help you bring the roof down in style. Who said you cannot have fun just because it is a daytime party?